Perilya is an Australian base and precious metals mining and exploration company which owns and operates the iconic Southern Operations zinc, lead and silver mine in Broken Hill New South Wales, the Potosi/Silver Peak zinc, lead, silver mine in Broken Hill and the Cerro de Maim�n Copper, Gold and Silver mine in the Dominican Republic. Perilya's exploration and development interests include projects throughout Australia, the Dominican Republic, Quebec Canada and in the state of Sabah in Malaysia. The Company�s principal Australian projects are located in Broken Hill (New South Wales), Mount Oxide (Mount Isa, Queensland) and Flinders (South Australia) regions. In addition, Perilya holds prospective exploration tenements in Queensland and Malaysia. Perilya’s Southern Operations underground mine produces two main products: a zinc concentrate and a lead concentrate. Ore mined is crushed underground and hoisted to the surface to be treated in the concentrator which is situated in the heart of Southern Operations mine. After completion of the treatment process, lead and zinc concentrates are railed from Southern Operations to the Company’s bulk loading facility at Port Pirie in South Australia for export. 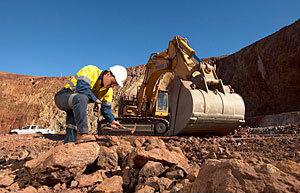 The Company has also commenced mining and treatment of ore from its Potosi/Silver Peak mine (located approximately 2kms from the Broken Hill town centre). Ore mined is trucked to the Southern Operations concentrator for processing and resultant lead and zinc concentrates are also railed to Port Pirie for export. Perilya carries out mining operations at its open pit Cerro de Maimón copper, gold and silver mine in the Dominican Republic. The mine is located in the municipality of Maimón which is approximately 70km northwest of Santo Domingo, the capital of the Dominican Republic. The deposit is a typical volcanic-hosted massive sulphide body (VMS type). Mining activities are performed by a contractor using a fleet of articulated trucks, rigid body trucks and hydraulic excavators. Mined ore is treated through the milling facilities and a copper, gold and silver concentrate is produced. The concentrate is then trucked to the Port of Río Haina on the southern coast of the Dominican Republic where it is blended, loaded and shipped in containers to overseas customers. Perilya is actively exploring for copper and gold in its Dominican mineral concessions, encompassing more than 328 square kilometres. Perilya also owns lateritic nickel resources in the Dominican Republic and a 60% interest in the Moblan Lithium Project in Quebec, Canada, both of which are currently undergoing development studies. Perilya is 100% owned by Shenzhen Zhongjin Lingnan Nonfemet Co. Ltd. Zhongjin Lingnan is a publically listed company on the Shenzhen Stock Exchange (Ticker: 000060) and China’s third largest zinc producer.